Is knowledge of right and wrong written on the human heart? Do people know God from the world around them? Does natural knowledge contribute to Christian doctrine?While these questions of natural theology and natural law have historically been part of theological reflection, twentieth-century Protestant theologians' radical reliance on revelation has eclipsed this historic connection. Stephen Grabill attempts the treacherous task of reintegration of Reformed Protestant theology with natural law by appealing to reformation era theologians such as John Calvin, Peter Martyr Vermigli, Johannes Althusius, and Francis Turretin who carried over and refined the traditional understanding of this key doctrine.In "Rediscovering the Natural Law in Reformed Theological Ethics" Stephen Grabill calls Christian ethicists, theologians and laypersons to take another look at this vital element in the history of Christian ethical thought. - Publisher Is knowledge of right and wrong written on the human heart? Do people know God from the world around them? Does natural knowledge contribute to Christian doctrine? While these questions of natural theology and natural law have historically been part of theological reflection, the radical reliance of twentieth-century Protestant theologians on revelation has eclipsed this historic connection. 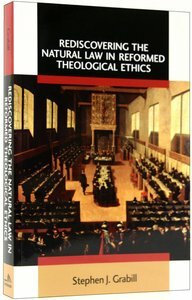 About "Rediscovering the Natural Law in Reformed Theological Ethics (Emory University Studies In Law And Religion Series)"
Stephen J. Grabill is a research scholar in theology at The Acton Institute for the Study of Religion and Liberty and the inaugural editor of the Journal of Markets and Morality. While this is his first book as a solo author, he was a contributing author for Beyond Self-Interest: A Personalist Approach to Human Action and Human Nature and the Discipline of Economics: Personalist Anthropology and Economic Methodology. American society is experiencing a profound crisis of trust, from government to mass media to educational and religious institutions. Whether we acknowledge it or not, this crisis affects us all. In Building Cultures of Trust Martin Marty proposes ways to improve the conditions for trust at what might be called the "grassroots" level. He suggests that it makes a difference if citizens put energy into inventing, developing, and encouraging "cultures of trust" in all areas of life - families, schools, neighborhoods, workplaces, and churches. His analysis is particularly poignant and his conclusions especially helpful when he advocates trust-building in the religion-versus-science debate, rather than the confrontational postures that characterize much of that debate today. Marty believes that such efforts at trust-building will do more than just trickle up to larger areas of society; they will become slow-spreading habits of honesty, inspiring trust on a culture-changing scale. Of course, Marty acknowledges that the reality of human nature tends toward trust-breaking, not trust-building - all the more reason, he argues, to develop strategies to bring about improvements incrementally, one small step at a time. In reply to those who remain skeptical that small-scale efforts at trust-building can make a difference, that efforts to understand and deal honestly with each other can improve the conditions for trust, Marty asks, What is the alternative? This substantial work by one of Europe's most respected twentieth-century legal minds unpacks Luther's doctrine of law, showing how it derived from his central theological concern, justification by faith. "When Johannes Heckel's Lex Charitatis appeared more than half a century ago, it brought new clarity to the much-disputed issue of Luther's understanding of the law and of God's governance of his created order. The Wittenberg reformer's use of the language of 'two kingdoms' and 'two governances' is still fiercely debated; having Heckel's work in English will assist scholars and students alike in putting Luther's insights to use in the context of twenty-first-century problems."